Firefox displays a lot of options when you right-click in the web browser. The list of items depends on the element that you right-clicked on, as some entries are only shown if you click on images, text or media contents. When you look at all of the entries you may notice that you only use a selection regularly, and that there are some that you have never used. One example: The right-click context menu of my Firefox version displays a Download Helper extension menu on all right-clicks, even if there is not a single media file on the page that can be downloaded. 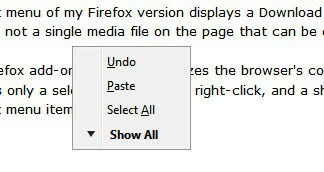 The Firefox add-on FfChrome optimizes the browser's context menu on the fly. 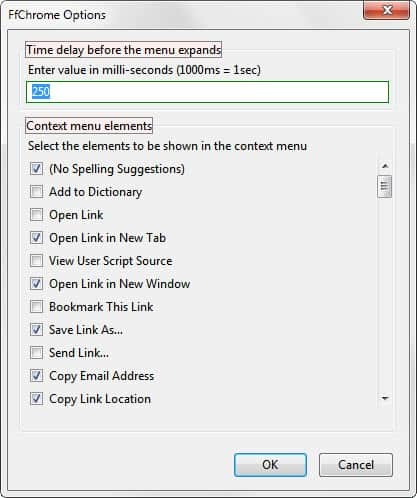 It automatically displays only a selection of items on right-click, and a show more link that switches the menu to all available context menu items. 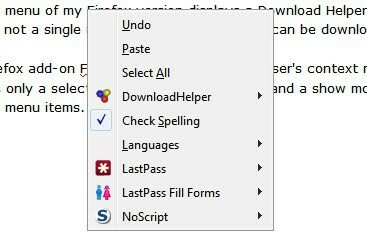 In this example, entries to extension items, the language selector and spell checking have been removed from the context menu automatically. Most, if not all of those, entries are not used regularly if at all. But what if you need an entry that the extension has removed automatically? You can configure the items that you want to be always visible on right-click in the extension's options. Here it is possible to enable or disable context menu items. This is not limited to standard Firefox items as all context menu entries of extensions are available for selection as well. All context menu items are displayed in one list which makes configuration slightly less comfortable as it could be, especially if a lot of extensions are installed that have added their own items to the browser's context menus. A search would be handy to find specific entries. Still, going through that list should not take to much time. The new entries become available immediately. The only other option in the settings of the extension is the time delay before the menu expands, which is set to a a quarter of a second by default. You can increase or decrease that value in the options. It takes some time to get used to the optimized context menu, but that should not take longer than a browsing session or two. The reduction should optimize the workflow further once you have grown accustomed to the new menu layouts. FfChrome is available for all Firefox versions from 3.0 onwards. It can be directly installed on the extension's Mozilla add-on repository page. Update: The extension has not been updated since 2011 but works in all recent versions of the Firefox browser without issues. That`s what I need. Thanks Martin for sharing. FF is too customizable…. This looks great for the context menu and very easy to configure. all menus and move items from menu on to another .